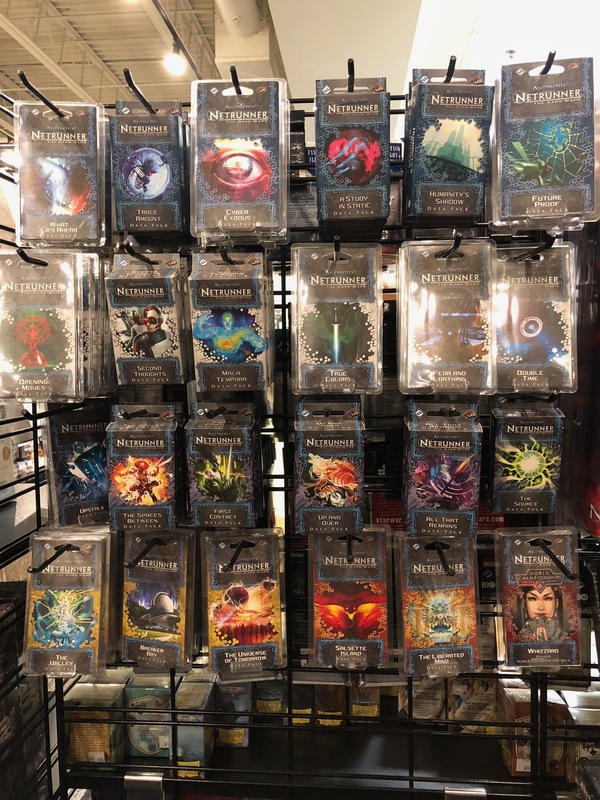 This is what’s in stock at FFG’s Event Center (it’s a retail shop that acts “independently” from their warehouse / online sales). they also had a handful of the 2017 decks (not in the picture), probably 6-7 of each? I’m willing to buy + ship packs at (close to) cost for anyone who’s missing something. Send me a PM if you need something off this rack. $14.95 + $5 s/h. Add $1/pack to s/h when ordering more than 1. One of the players from our meta has asked us to do the same thing. There are still some folks who got into the game recently that are going to try to complete their cardpools. Good idea to let folks know what they find! They’re sold out of the last 4 cycles. But the first 4 are all there. Rotation happened. They do have a good 10+ of the 2017 Worlds decks now. Since they’re POD, I’m guessing they will be able to keep those stocked pretty well up until the deadline. Whether or not they ship to other retailers … that’s the question. The 2016 Whizzard deck is gone now. I’ll keep an eye on it, once a week or so (on restock days), and update this post if I see anything from the newer cycles pop in. Any chance they have the Monster Slayer Novella floating around? I’d like to pick that up, but Amazon is acting silly asking 14 bucks S and H for it. I don’t think I saw any of the novellas. I’ll keep an eye out. Interested in the Source. Would you be willing to send to europe? how much for S/H? S/H international is about $15-$25, depending on country, so it might not be worth it. PM me an address and I can tell you exactly. FYI–Found it at Atomic Empire in North Carolina; put my order in there. But thanks for being willing to check!